I’ve done some work in researching the Gross Radio company, and have also worked with a friend to reproduce the labels which Gross applied to their coil sets, please see the “Gross Label” button on the left menu. I’d be interested in any and all info on the Gross company, unfortunately, time seems to have erased a great deal. The best sources which I have found have been Raymond Moore’s excellent book “Transmitters 1930-1980”, as well as older QST magazines. So if you have an advertisement, manuals, or even Gross equipment, I’d be delighted to hear from you. I would of course be happy to pay any copying costs as needed. 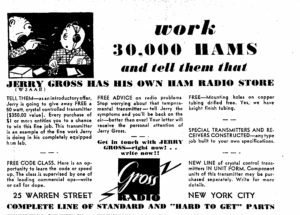 For the benefits of other Gross aficionados, and those interested in early radio history, I’ve included what information I have on hand, as well as information that others have been enough to share with me, on this site. Please check the menu to the left for other options. The time was the 1930s, and America, like much of the world, was mired in the midst of the Great Depression. Jobs were gone, bread lines were common, and times were admittedly hard. Yet, to borrow a phrase from Dickens’s, “It was the best of times, it was the worse of times.” for the darkest days for our country were the beginning of the Golden Days of radio. Americans needed distractions from the cares of the day, and radio had captured the American imagination like no other invention before. One could now “listen in” to the world, bringing news from around the globe into the living room each evening. With funds limited, the time honored tradition of home brewing or building your own set, was the word of the day. Those who bought “commercial jobs”, or assembled sets, were often looked upon with disdain, perhaps even with a tad of envy and for breaking tradition by the more experienced of the amateur community. Although fone modulation was used, CW was still the dominant mode, as it was simpler to build, therefore less expensive to the cash strapped amateur. Vacuum tubes were costly, and therefore most sets consisted of simple oscillators with one stage of gain, MOPAs, Hartleys, TPTG were the rule of the day. Gross Radio, like many other radio business of the day, offered their product in both kit, and for an additional charge, in assembled form. Although Gross’s most famous product is arguably the CW/CB-25 series of transmitters, larger, higher power sets, like the CW and CB-100 were offered, but the CW/CB-25 remained the most popular of , but the CW/CB-25 remained the most popular of Gross’s offerings. The company also offered a line of receivers, antenna meters, and even a station monitor. The Gross receivers took their names from the avian kingdom, with names like the “Hawk”, advertised at “$22 net”, and the “Eagle” a three tube regen comparable to the National SW-3, for $11.95. These sets, along with the Gross transmitters, were advertised in the back of QST for a number of years, no doubt inspiring the young ham to deliver many a newspaper, or mow many a lawn in order to spring for a new set. The Gross sets were unashamedly simple for the day, far eclipsed by contemporary offerings of National and Hammurlund, yet they were affordable for the beginning radio amateur, an important consideration of that era.